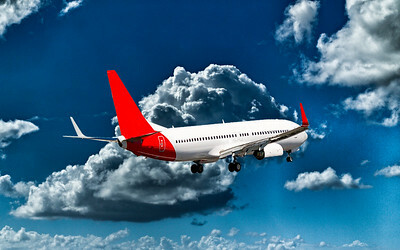 Aircraft in flight with cumulonimbus cloud in blue sky. Australia. Sydney, New South Wales, Australia - February 4. 2016: commercial passenger jet aircraft in flight departing Kingsford Smith Airport, Mascott. With vibrant white cumulonimbus cloud in a cobalt blue sky. Aircraft in flight with cirrus cloud in orangge sky. Australia. Sydney, New South Wales, Australia - August 1. 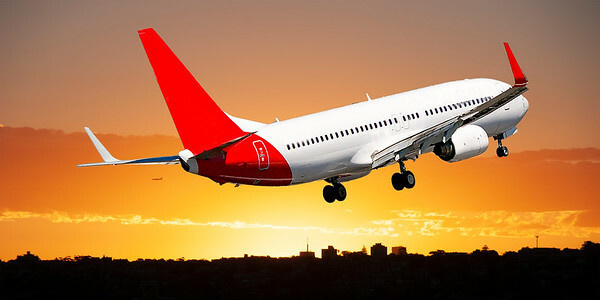 2014: Virgin Airlines commercial passenger jet departing Sir Kingsford Smith Airport Mascott, at sunset, with orange coloured cirrus cloudy sky. Aircraft in flight with cumulonimbus cloud in blue sky. Queensland. A passenger jet aircraft flyng in a vibrant blue sky, with well developed bright white coloured cumulonimbus clouds, closeup view over tropical Queensland, Australia. Sydney, New South Wales, Australia - February 27. 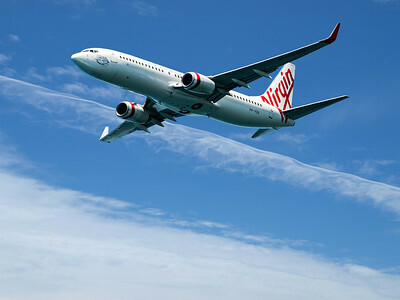 2015: Virgin Airlines commercial passenger jet aircraft in flight departing Sir Kingsford Smith Airport, Mascott. With vibrant white sunbeams in a vivid blue sky. 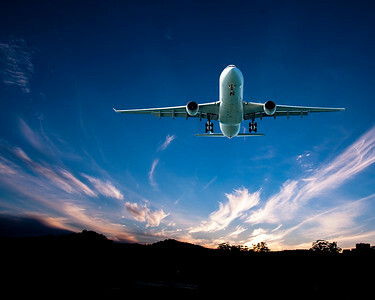 Jet Airliner Flying in an orange coloured stratus cloudy sky. 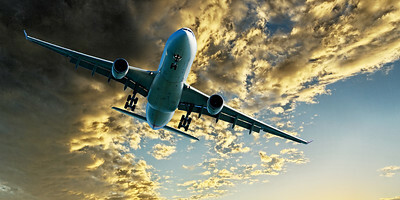 A passenger jet airliner flying overhead closeup with a yellow and orange coloured stratus cloud in an apricot colour sky. Atmospheric beauty in nature. Sydney, New South Wales, Australia. Aircraft in flight with Cirrus cloud in blue sky. Australia. 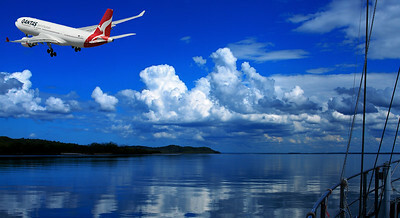 An artistic skyscape view of a commercial jet aircraft flyng in a vibrant blue sky, with bright white coloured Cirrus clouds. Atmospheric beauty in nature. Sydney, New South Wales, Australia. Jet Airliner Flying in an Orange colour Altocumulus cloudy sky. Australia. A passenger jet airliner flying above closeup with an Orange & Gold coloured Altocumulus cloud formation in a yellow sunset sky. Atmospheric beauty in nature. New South Wales, Australia. Commercial aircraft in flight with Cirrus cloud in blue sky. Australia. Sydney, New South Wales, Australia - October 4. 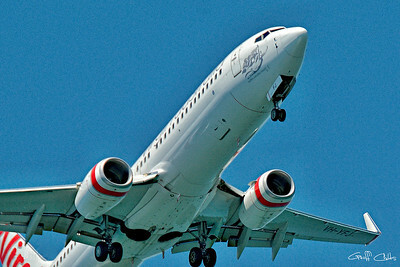 2014: Virgin Australia commercial passenger jet aircraft in flight closeup departing Kingsford Smith Airport, Mascott. With vibrant white cirrus cloud in a blue sky. 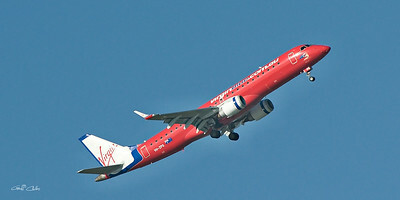 Commercial aircraft taking off. Viewed from directly under. Photographed at Sydney International Airport,Australia. PLEASE NOTE. All Images in this gallery are delivered Free, electronically, worldwide as a Digital Download WITHOUT the Bold Watermark and the small artist's signature. This image is ready for you, or your local printer, to print and it also may be used as a colourful desktop screensaver. DOWNLOADS HELP. For EASY to follow image Download Instructions, please Click: http://www.sunnypicsoz.com/HELP-With-DOWNLOADS All photos can also be supplied as a Hard Copy Print, and with options to buy as a "Mounted and Framed Art Piece" ready to hang, ( However, it is usually Less expensive and much Quicker to have a Local printer in your own country or locality print for you off our - Instant Free Electronically Delivered "Digital Download File" ). For more information please CONTACT ME. To Contact Me for any personal assistance, please Click "CONTACT ME" in the NAVIGATION Menu (Top Right) Affordable Quality Images - With instant worldwide free electronic delivery. (C) 1998-2018 Geoff Childs. All rights reserved. 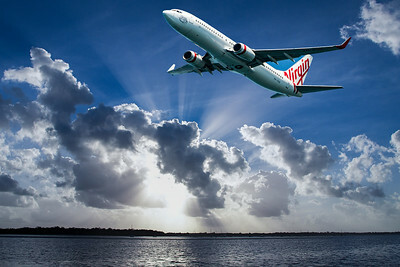 An artistic skyscape view of a commercial passenger jet aircraft flyng in a vibrant blue sky, with bright white coloured Cumulonimbus clouds. New South Wales, Australia. Commercial aircraft activities at Sydney Airport Sydney (Kingsford Smith) Airport is located in the suburbs of Arncliffe and Mascot in Sydney, New South Wales. 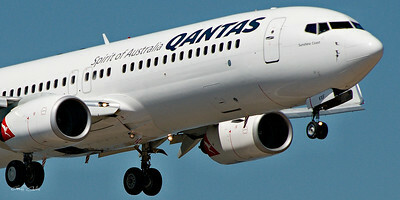 It is the only major airport serving Sydney, and is a primary hub for Qantas, as well as a secondary hub for Virgin Australia and Jetstar Airways. 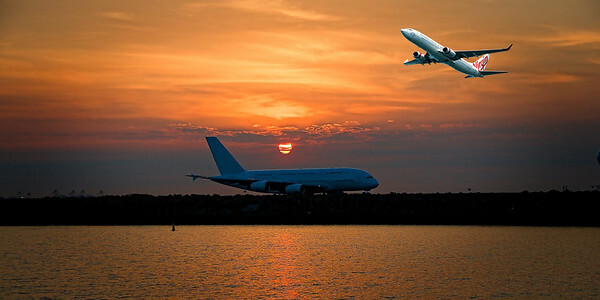 Situated next to Botany Bay, the airport has three runways, colloquially known as the "east–west", "north–south" and "third" runways. 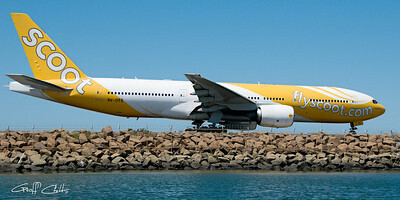 Sydney Airport is one of the oldest continuously operated airports in the world, and the busiest airport in Australia, handling 35,630,549 passengers in 2011 and 280,910 aircraft movements in 2011. It was the 31st busiest airport in the world in 2012. 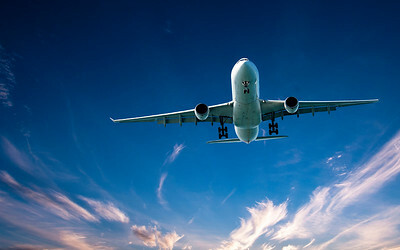 Jet Airliner Flying in a yellow coloured cumulus cloudy sky. 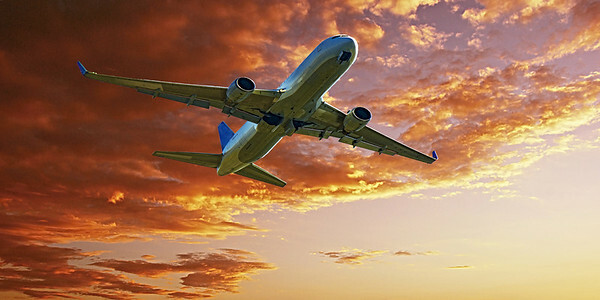 A passenger jet airliner flying above closeup with a Golden coloured Cumulus cloud formation in a blue sky at Sunset. Atmospheric beauty in nature. Sydney, New South Wales, Australia. Commercial aircraft activities at Sydney Airport Sydney (Kingsford Smith) Airport is located in the suburbs of Arncliffe and Mascot in Sydney, New South Wales. DOWNLOADS HELP. For EASY to follow image Download Instructions, please Click: http://www.sunnypicsoz.com/HELP-With-DOWNLOADS To Contact Me for any personal assistance, in the NAVIGATION Menu (Top Right) please Click "CONTACT ME". Sydney, New South Wales, Australia - April 12. 2016: Qantas passenger jet aircraft airborne, departing Sydney over Botany Bay with vibrant white cumulonimbus cloud in a vivid blue sky. Jet Airliner Flying in an Golden coloured altocumulus cloudy sky. 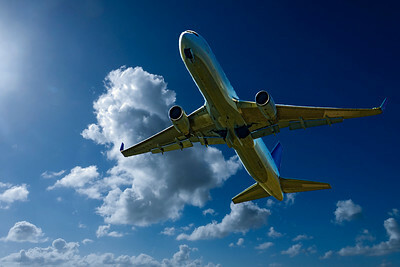 A passenger jet airliner flying overhead closeup with a yellow coloured altocumulus cloud formation in a blue sky. Atmospheric beauty in nature. Queensland, Australia. 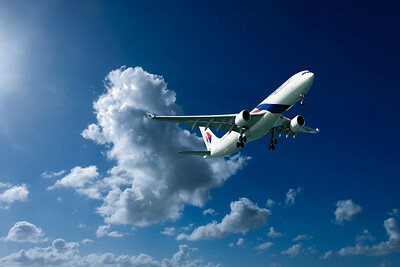 A skyscape view of a commercial jet aircraft flyng in a vibrant blue sky, with bright white coloured Cirrus clouds. Atmospheric beauty in nature. Sydney, New South Wales, Australia.